Unlike the bacteria that cause diarrhea, fever and many other symptoms, probiotics are live microorganisms that may improve your health and boost your resistance to some illnesses. They may also improve intestinal health for some people. Foods rich in probiotics may enhance your immune system, reducing your risk for some diseases, according to ongoing research. But preventing diarrhea and other digestive problems is an important reason to add probiotics to your diet. Talk with your doctor before you take probiotics if you have an illness. Head for the market. Probiotics are living organisms that must be refrigerated. 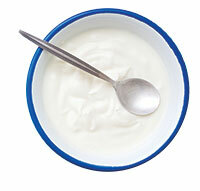 Fermented dairy products include most yogurt, buttermilk and kefir (similar to yogurt). Try soy yogurt if you don’t like or can’t tolerate dairy. Start slowly. Eat small amounts, such as a 2- to 4-ounce serving. Work up to 6 to 8 ounces a day. Use probiotic products as ingredients. Top a baked potato with plain yogurt, use buttermilk in a salad dressing or add kefir to a fruit smoothie. Don’t cook fermented dairy products. You’ll kill the friendly microorganisms. Make probiotics a habit. Probiotics don’t become a permanent part of your body flora. That’s why you have to take them every day or every other day.